Reinforced thermoplastic pipe, or RTP pipe, is a generic term referring to pipes reinforced by high strength composite fibers, such as glass, aramid or carbon. It is developed to replace medium pressure steel pipes in response to the growing demand for non-corrosive conduits for application in the onshore oil and gas industry. The material used in the construction of RTP pipes are usually PE, PA-11 or PVDF, and the reinforcement is mainly Aramid or Polyester fiber. 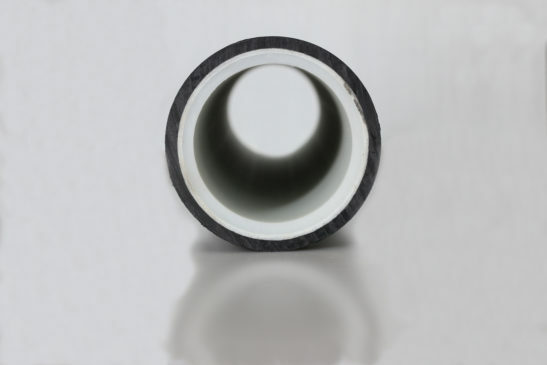 In TOPOLO, we provide continuous glass fiber reinforced thermoplastic HDPE UD tapes for the material of your pipes, which performs much better in tensile strength and flexural strength. The reinforced thermoplastic pipe consists of 3 basic layers: an internal thermoplastic liner, a continuous fiber reinforcement helically wrapped around the pipe, and an external thermoplastic jacket. The liner acts as a bladder, the fiber reinforcement provides strength, and the jacket protects the load-bearing fibers.